With the Company Master, you can view company information of the people whose business cards you have received. Sansan also has a function called the Organization Tree. With this you can visualize what people from which departments in that company the people in your company have met. 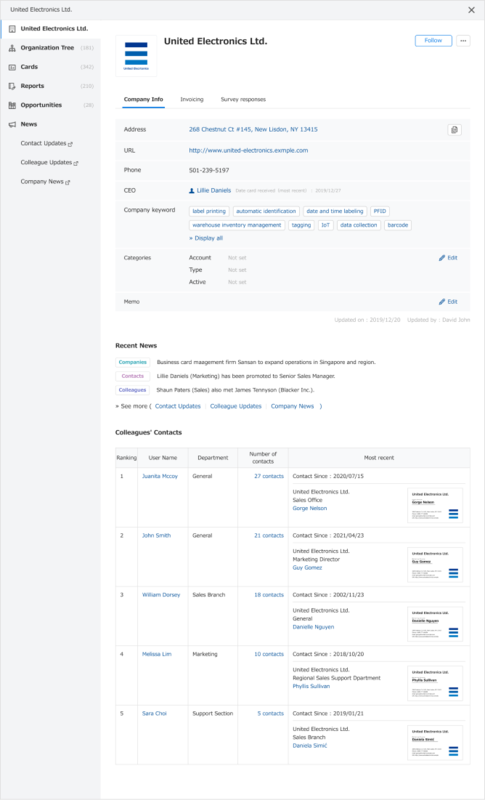 Also, with Numbers of cards held by each user (TOP5), you can quickly find out which user in your company has the deepest relationship with that company. *Spaces within department names will be recognized as divisions, and thus be divided into levels. Sometimes this may not be accurate to that company's organization, so when importing business card data, as much as possible remove spaces from department names. Companies will be recognized as the same company for the Company master when any of the four following conditions is satisfied. Condition 1. Company name and Zip code are the same. Condition 2. Company name and address are the same. *This is not reflected immediately; some time is required before it is reflected. These updates are done at certain fixed intervals. *Company information registered in the Company master is generated based on the information in business cards (most recently received card). The functions you can view from the Company Master screen are as follows. This is an item that users need to set. You can edit this from "Admin Settings", and then "Category Settings". The five people in your company who have received the most business cards from this company will be displayed. With that, the most recently received business card for each user will also be displayed. From the icon, the organization tree can be downloaded and printed. Please do a search specifying the date received or the holder. * To download, permission to "Download organization tree" is necessary. Please request the system administrator in your company to give this permission. The Company Master screen can be reached by clicking on "Company" from the Business card list screen or by clicking on the Company icon from the enlarged image of the business card. Q. The number of cards received on the Organization Tree is different than the number on the Business card list. Why is that? A. Data may not be reflected yet, as the Company master is regenerated after scanning or business card data editing is done. Also, as the numbers or people in the Organization Tree are brought together by company, they may not agree with the numbers in the business card list. Q. Department divisions are more than is necessary. Why is that? A. Spaces in department names are recognized as divisions, and thus make new levels. Try to remove spaces from department names as necessary. Q. The same department is being generated twice, and the people in it are divided into two groups. Why is that? A. When the department is written differently, it will be made into multiple departments. Correct the department name by standardizing how it is written. When the Organization Tree is regenerated, it should be displayed together. Q. The number of cards held by user is not the same when I click on the link and it is displayed. Why is that? A. In the number of cards held, the following cards are included, so when you move to the Business card management screen, they do not agree.